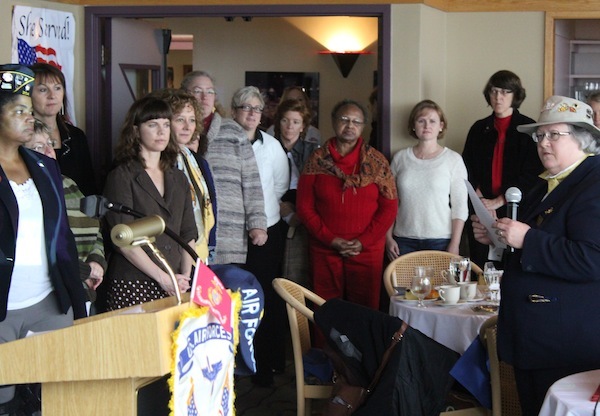 US Marine Corps veteran Julia Sheriden (far right) recognizes the service of other military veterans including Sheila Sebron (far left) at a Veterans Day brunch organized by Outreach and Resource Services for Women Veterans. Military veterans are more likely than other Americans to experience both unemployment and homelessness. Women are at especially at risk for housing instability, in part because they are sometimes not recognized as veterans and don't get connected with veteran-specific services that can help them get back on their feet. On this Veterans Day, we share why it's imperative that our society recognize the service of all military men and women. As Veterans Day nears and we celebrate our nation’s heroes, it’s important to also recognize that many veterans face challenges, including homelessness, as they re-enter civilian life. Veterans are more likely than their civilian counterparts to experience homelessness, and women veterans are particularly vulnerable. Fortunately, many people are working to make sure our veterans have safe homes. The Low Income Housing Institute’s Community Engagement & Advocacy Manager Ania Beszterda Alyson shares a story of a veteran and single mom who has experienced homelessness three times, but is now on a path to a better future after finding a stable home.